Be found in Europe in the Baltic, in Ireland, in the Alps and in the south-western regions of Russia. In the Nordic countries outside Norway we find it in Sweden and Finland. In Norway very scattered in the hills and in the mountain forests of Oppland (Gran) and northwards to More og Romsdal (Fræna), Trøndelag (Lenvik) and Troms (Tromsø and Karlsøy). North plant grows mostly flat rich fens. 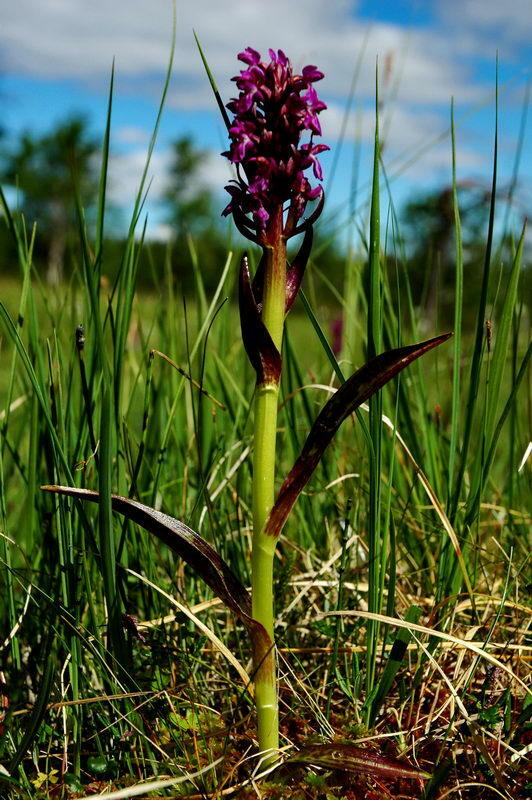 In the lowlands of eastern Norway around the Oslo Fjord and the Great Lakes region around Oslo and Skien fjord’s more coarse forms with wider leaf often with annular spots that probably are related to the mountain type of Early Marsh-orchid. Chromosome Numbers 2n = 40. This species is most common in mountain forests in extreme rich fen, and often very humid and wet. It can also be found on damp meadows such as beach-meadow. It is a low-growing plant that is rarely more than 15 to 30 cm high. The plant’s leaves upper and lower sides have dense purple-coloured spots, sometimes almost congruent to almost solid. Supporting leaves are quite purple-brown. 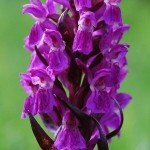 The flowers are purple, red or rarely bright and sitting on a purple-brown dense cylindrical inflorescence and are very similar to the flowers of Early Marsh-orchid. 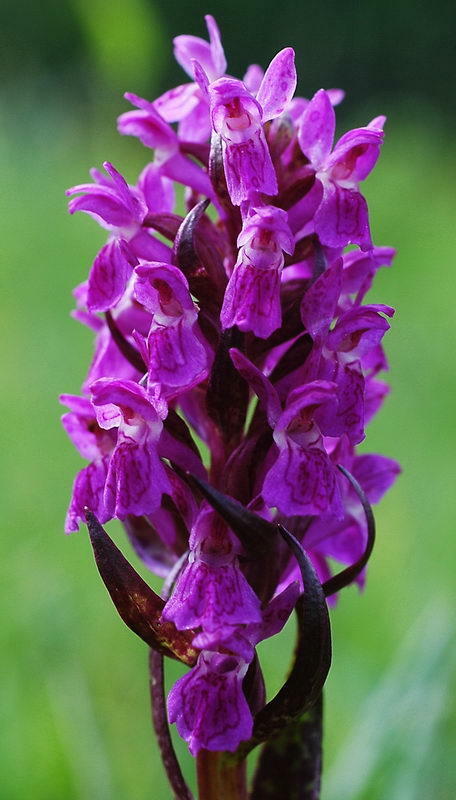 The spore is facing almost straight back and is slightly stronger than in Early Marsh-orchid. Dactylorhiza incarnata ssp. cruenta in mountain region and North (ssp. cruenta var. borealis) are associated with mountain form of Early Marsh-orchid and differs only from those with their speckled leaves. In mountainous regions it blooms in July. Dactylorhiza incarnata ssp. cruenta is protected under the Nature Diversity Act and considered as endangered on Norwegian Red List.